In stock. Order in the next 11 hours, 33 minutes and it will go out today! This classic prop is a great way to make silk scarves, sponge balls, spring flowers or spring bills appear in a flash! A cube, totally transparent, is shown, held between your hands. Have your kid audience say the magic word as they watch the cube and, just like magic, it's filled with scarves, money or any other compressible prop. The Crystal Clear Cube is available in a 4" or 6" cube size. The smaller one has a gravity flap. Just give it a shake and your magical surprise will appear. The larger cube has more room for a larger load. It also has a spring-loaded mechanism which lets your audience experience a "right-before-your-very-eyes" flash appearance without any apparent movement of the cube. Both cubes will work with compressible fake fruit as well as large sponge balls, spring bills, spring flowers and, of course, silks. If you're looking for a device to make objects appear, either size Crystal Clear Cube is super-easy to do. The magicians of Vanishing Inc. have even used it in corporate meetings when an executive needs to make money appear and has only five minutes to learn the trick. It's that easy! 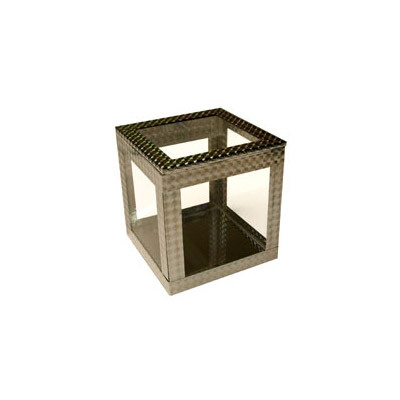 The Crystal Clear Cube has so many possibilities which is what makes it a great utility prop. Use it to add a touch of magic during a story-telling trick. It's also a great way to start your show with a flash. At AmazeKids, we've used it to make a prop appear, like a giant sponge ball or a sponge cube that is used for more magic-making later in the show. You'll enjoy performing the Crystal Clear Cube. As you check out your shopping cart on AmazeKids.com, you'll be able to choose the size that's right for you. It's so good, you'll even fool yourself in your rehearsal mirror! Go ahead, order it, and see for yourself!